The sky sometimes has its limits, according to new research from two University of Chicago atmospheric scientists. A study published May 24 in Science offers an explanation for a mysterious and sometimes deadly weather pattern in which the jet stream, the global air currents that circle the Earth, stalls out over a region. Much like highways, the jet stream has a capacity, researchers said, and when it's exceeded, blockages form that are remarkably similar to traffic jams–and climate forecasters can use the same math to model them both. The deadly 2003 European heat wave, California's 2014 drought and the swing of Superstorm Sandy in 2012 that surprised forecasters–all of these were caused by a weather phenomenon known as "blocking," in which the jet stream meanders, stopping weather systems from moving eastward. Scientists have known about it for decades, almost as long as they've known about the jet stream–first discovered by pioneering University of Chicago meteorologist Carl-Gustaf Rossby, in fact–but no one had a good explanation for why it happens. "Blocking is notoriously difficult to forecast, in large part because there was no compelling theory about when it forms and why," said study coauthor Noboru Nakamura, a professor in the Department of the Geophysical Sciences. Nakamura and then-graduate student Clare S.Y. Huang were studying the jet stream, trying to determine a clear set of measurements for blocking in order to better analyze the phenomenon. 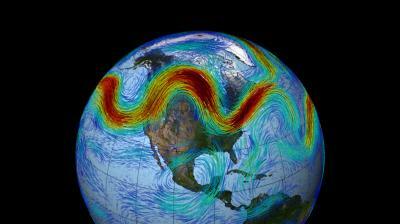 One of their new metrics was a term that measured the jet stream's meander. Looking over the math, Nakamura realized that the equation was nearly identical to one devised decades ago by transportation engineers trying to describe traffic jams. "It turns out the jet stream has a capacity for 'weather traffic,' just as highway has traffic capacity, and when it is exceeded, blocking manifests as congestion," said Huang. Much like car traffic, movement slows when multiple highways converge and the speed of the jet stream is reduced due to topography such as mountains or coasts. The result is a simple theory that not only reproduces blocking, but predicts it, said Nakamura, who called making the cross-disciplinary connection "one of the most unexpected, but enlightening moments in my research career–truly a gift from God." Their initial results suggest that while climate change probably increases blocking by running the jet stream closer to its capacity, there will be regional differences: for example, the Pacific Ocean may actually see a decrease in blocking over the decades. "It's very difficult to forecast anything until you understand why it's happening, so this mechanistic model should be extremely helpful," Nakamura said. And the model, unlike most modern climate science, is computationally simple: "This equation captures the essence with a much less complicated system," Huang said. Citation: "Atmospheric Blocking as a Traffic Jam in the Jet Stream," Nakamura and Huang, Science, May 24, 2018.